Brand design specialists ButterflyCannon has created a limited edition Domaine Chandon summer bottle, inspired by the great “All-American summer”. 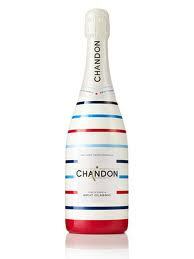 The design for both the standard 750ml and 187ml bottles is said to evoke a classic Hamptons-style yachting theme with red, white and blue stripes. ButterflyCannon has also designed Chandon’s limited edition ice-buckets, towels, tote bags, deck chairs and ice cream carts – all sporting the same theme. “ButterflyCannon have managed to perfectly capture the essence of an American Summer for our limited edition bottles and in doing so created the perfect summertime accessory for our consumers” said Chloe Lloyd-Jones, vice president – Wine Portfolio.